Just want to say before I’m convicted of false pretences – I’m not a chef, or writer or anything professionally foodie – I just love food. As I always want to push my cooking abilities, my experiment today has been making fresh almond and chocolate macaroons. Boy have I learnt. They taste amazing and look like a total mess! 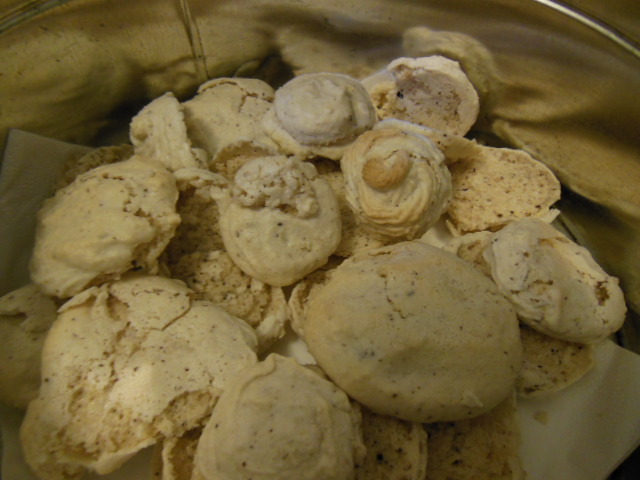 They collapsed as I couldn‘t wait to taste them and they stuck to the grease proof paper, overall a visual failure. But I loved them! You just need patience and apparently a silicone tray will help. 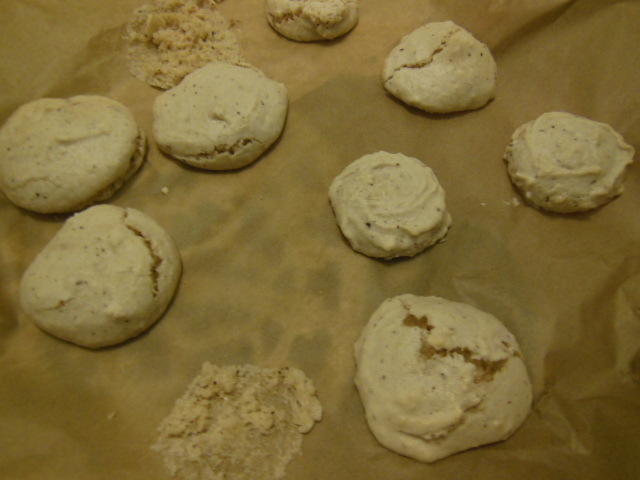 The taste of fresh macaroons is nutty, sweet, oozy and amazing and they weren’t actually that difficult. I’ve avoided making them for years as I thought they would be hard to do but the making bit was really easy, just got to sort out the baking bit next – and if I can, you can too! Mix up the ground almonds, icing sugar and cocoa then set aside. Using an electric whisk (unless you’ve got biceps of steel!) slowly whisk the egg whites in a big bowl until it’s at the ‘stiff peaks’ stage. Now slowly whisk in the cream of tartar and caster sugar, increase the speed on the whisk as the mix thickens. According to the packet the cream of tartar helps to volumise and stabilise the whisked egg whites, so if you can’t find any it’s probably not essential. You can add food colouring or flavourings at this point. I don’t fancy the food colouring as it is so artificial but I’m going to try coffee or fruit essences. Next, gently fold in the almond, icing sugar and chocolate mix into egg mixture a little at a time – it goes through looking like shaving foam then begins to thicken into a bit more of a paste. Once it’s all been mixed together, spoon it into a piping bag with a 1cm nozzle. Pipe the mixture into circles about 5cm across on a baking sheet lined with (I would now recommend) silicone baking parchment. Smooth them with a wet finger into the perfect macaroon biscuit shape. Now put them aside to rest for up to an hour until they are not sticky any more to touch. Heat the oven to 160C/315F/Gas 2½. Bake for 10-15 minutes, cool for 5 minutes then peel off the baking paper and cool completely. Now you can sandwich them together with jam, chocolate spread, butter cream … and chill – you and the macaroons! 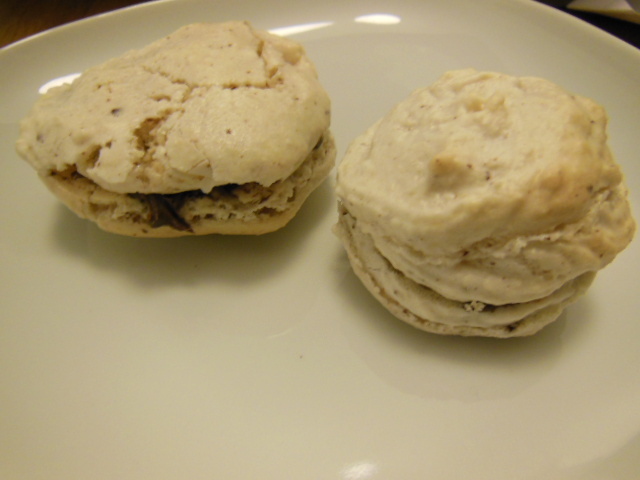 This entry was posted in Recipes and tagged almond, baking, chocolate, coffee, macaroon, macaroons. Bookmark the permalink.